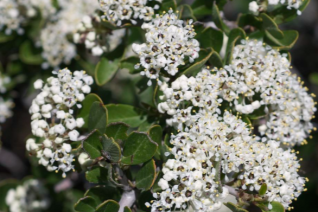 This genus of shrubs is native primarily to the west coast with the majority of species in California and then Oregon. We love ‘Wild Lilacs’ as they are sometimes called for several important reasons. They represent excellent climate adaptation. Almost all are native to winter wet/summer dry conditions. They thrive in our climate with little intervention from the gardener. 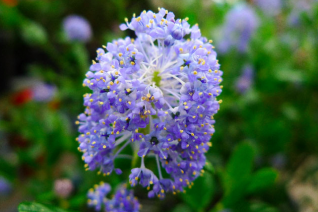 Flowers: blue- no other shrub comes close to the display of blue flowers housed in this genus. 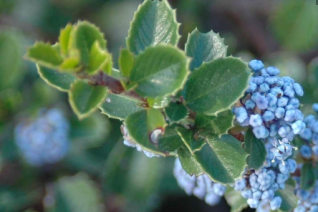 The most blue cultivars and species hail from central and northern California and have been grown in our region for eons. Fast growing and extraordinarily drought tolerant they cruise through our dry summers with no visible signs of stress. In fact they loathe the combination of wet/warm soils. So no summer water is advised. 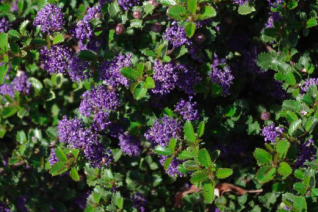 They range from large shrubs to ground covers and are useful in a host of situations. Full sun and average well drained soil including clay soils on slopes. They even fix nitrogen with their roots which means they earn their own lunch. Lifespan: typically they live on average 10 years but for the ground cover types which persist quite a bit longer. They make ideal plants for new gardens as they grow rapidly and even years after their demise the soil beneath them remains enriched, loose and friable. A great place to grow tomatoes. 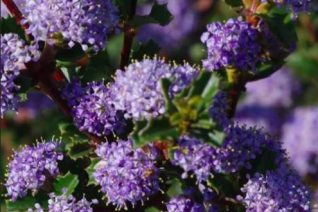 We have introduced several varieties of Ceanothus thyrsiflorus native from Lane county Oregon to Santa Barbara County California and we’re always on the search for more Oregon cultivars. Water them until you see them start growing in earnest and then taper off. And then only the water that falls from the sky. To prune, tip prune after blooming to resize, encourage density. Usually it is not necessary. 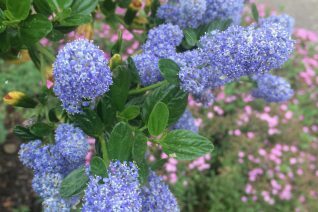 The size of Ceanothus is completely dependent on the fertility of the soil. Rich soil HUGE, poor soil restrained. They make wonderful urban shrubs- tolerant of extreme reflected heat as well as hot dry places. 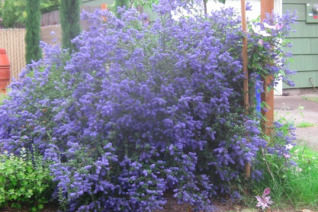 Big and arching evergreen shrub that becomes an unbelievable sea of ultramarine blue flowers in April. To 8′ x 8′ very quickly in full sun and well drained soil. Amenable to clay if unwatered in summer. Once established NO summer water at all. Grows quickly to its ultimate size give it room. Leaves burn below about 12ºF but recovery is rapid in spring and seldom sacrifices blooms. Give this rapid growing shrub room to grow. Completely drought adapted in our climate. One of the most stunning wild lilacs ever released. 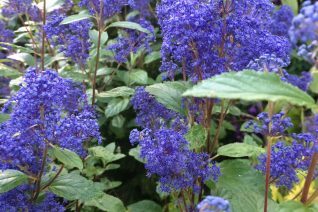 One of the cold hardiest blue flowered cultivars and one of the earliest to bloom as well. An open spreading shrub with prickily deep green leaves. 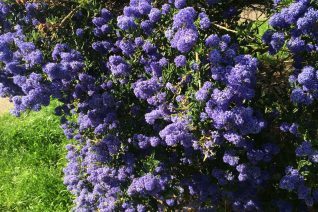 In March/April the whole shrub is obscured in violet blue clouds of flowers. 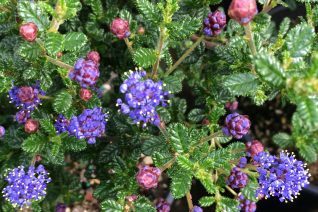 Upon first viewing in bloom most people are shocked at how showy this evergreen shrub is. To 7′ x 5′ in five years in any well drained soil with little to no summer water. 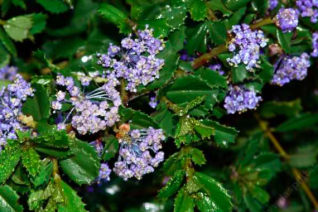 Very adaptable to clay soils, especially on slopes- as with all Ceanothus avoid boggy sites. One of the toughest cultivars that also takes very well to pruning which should be done after blooming to increase density if needed. Blooms on wood from the previous year and the button shaped flower clusters are so profuse that they obscure the foliage. Tolerates blasting reflected heat and is great in hot urban situations. And makes a wonderful informal hedge for wild areas. Full sun. 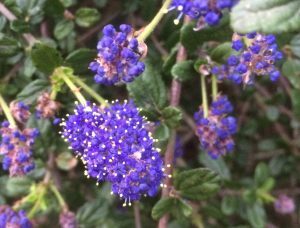 Moderately deer resistant- unusual for a Ceanothus. Cold hardy to 0ºF. 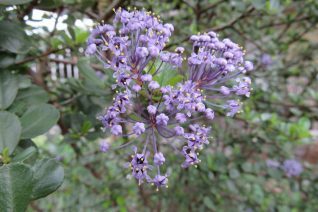 The cultivar name might obliquely refer to the flower color but its an apt comparison to this tough , tough, shrub as well. No summer water. 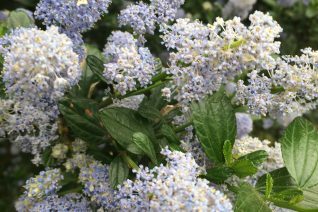 We’ve been impressed with this extraordinarily deep blue flowered Wild Lilac released by Suncrest Nursery. A fine textured deep green evergreen shrub to 4′ x 8′ and forming a graceful cascading dome. 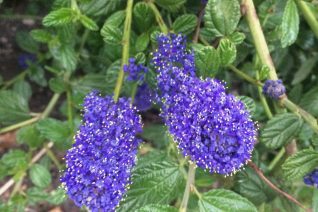 Profuse cobalt blue flowers appear for 2-3 weeks in April. 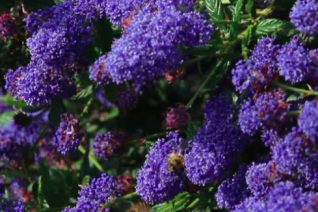 Extremely drought tolerant shrub for full sun and average to poor well drained soil. Little to no summer water required. Locate out of the path of subfreezing gorge winds. One of the most graceful and showiest of the genus. 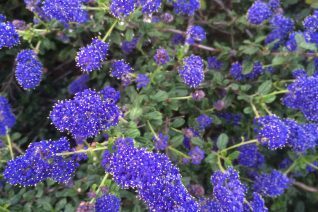 This is by far the lowest growing ground cover Ceanothus that we grow and in commerce in general. The completely prostrate evergreen with deep green glossy prickly leaves forms a dense ground cover in full sun and well drained sites. In March button shaped clusters of light blue flowers foam above the foliage. Loved by early butterflies and bees. To just 6″ tall and spreading to 4′ wide. Moderately fast growth. Tolerates some summer irrigation. Best on hot sunny slopes. Winter damage (below 10ºF) recovers quickly in spring and does not sacrifice blooms. Trailing stems will root where they hit the ground. Excellent candidate for erosion control. Great performance at the Oregon Coast.